Android is an open source mobile operating system, built over Linux kernel. This Android tutorial is comprehensive guide on basic to advanced concepts of Android app framework., it helps you to develop Rich Mobile Applications over Android Platform. These tutorials are designed for beginners and experienced software professionals who want to learn or explore basic to advance concepts of mobile application development using Android Platform. 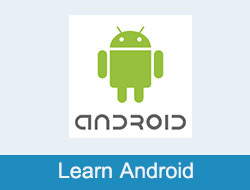 Android applications are built over Java programming environment. If you are new to Android application development, before proceeding with this tutorial it is important to have basic understanding of Java programming and fundamental concepts about the Android app framework.